DANBURY, Texas — Ray Allen Kulhanek is kicking off his season this weekend at the 44th annual Spring Nationals. 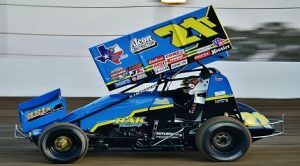 The first opportunity is this Friday and Saturday at the marquee Lucas Oil ASCS National Tour event hosted by Devil’s Bowl Speedway in Mesquite, Texas. Kulhanek said his goal for the season-opening doubleheader is consistency. “The first step to being able to win is to be in the show,” he said. “That’s always the first step. Also, in a logical deal being the first race of the season for myself, to come out of both nights with top 10s would be great to me. However, I definitely don’t ever pull out of the gate at the shop without the expectation of winning.